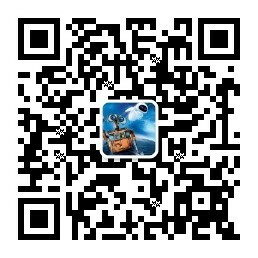 历史上，认知科学和语言学与人工智能学科几乎是同时出现的，他们都深深地受到计算机的影响(Chomsky, 1956) (Miller, 2003)。他们的目的都是基于信息或符号处理机制解释人的精神活动。早在20世纪80年代，这两个领域就都认为递归式和过程式（基于规则的）符号处理是认知的最高级形式(highest mark)。The Parallel Distributed Processing (PDP) or connectionist revolution cast aside the symbol-processing metaphor in favour of a so-called “sub-symbolic” description of thought processes (Rumelhart et al., 1986). 图4. NTM Generalisation on the Copy Task. 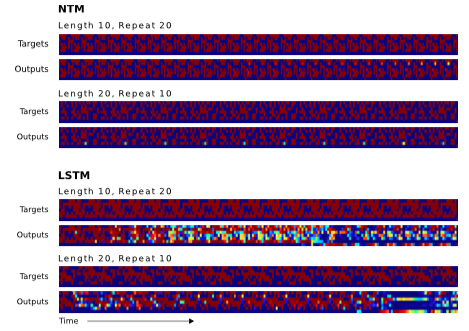 The four pairs of plots in the top row depict network outputs and corresponding copy targets for test sequences of length 10, 20, 30, and 50, respectively. The plots in the bottom row are for a length 120 sequence. The network was only trained on sequences of up to length 20. The first four sequences are reproduced with high confidence and very few mistakes. The longest one has a few more local errors and one global error: at the point indicated by the red arrow at the bottom, a single vector is duplicated, pushing all subsequent vectors one step back. Despite being subjectively close to a correct copy, this leads to a high loss. 图5. LSTM Generalisation on the Copy Task. The plots show inputs and outputs for the same sequence lengths as Figure 4. 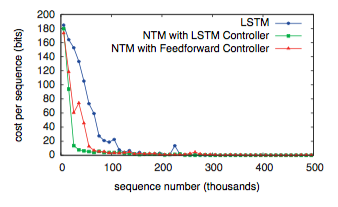 Like NTM, LSTM learns to reproduce sequences of up to length 20 almost perfectly. However it clearly fails to generalise to longer sequences. Also note that the length of the accurate prefix decreases as the sequence length increases, suggesting that the network has trouble retaining information for long periods. 图6. 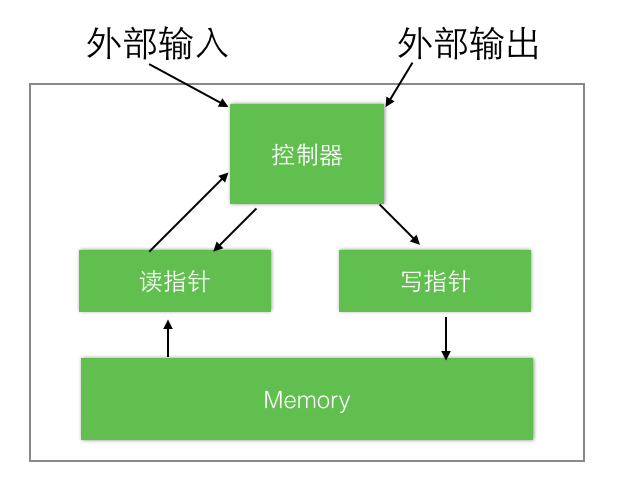 NTM Memory Use During the Copy Task. 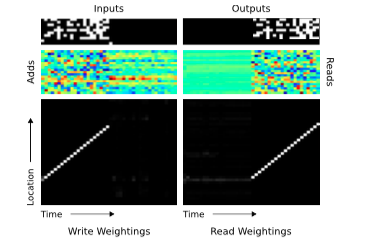 The plots in the left column depict the inputs to the network (top), the vectors added to memory (middle) and the corresponding write weightings (bottom) during a single test sequence for the copy task. The plots on the right show the outputs from the network (top), the vectors read from memory (middle) and the read weightings (bottom). Only a subset of memory locations are shown. Notice the sharp focus of all the weightings on a single location in memory (black is weight zero, white is weight one). Also note the translation of the focal point over time, reflects the network’s use of iterative shifts for location-based addressing, as described in Section 3.3.2. Lastly, observe that the read locations exactly match the write locations, and the read vectors match the add vectors. This suggests that the network writes each input vector in turn to a specific memory location during the input phase, then reads from the same location sequence during the output phase. 图7. Repeat Copy Learning Curves. 图8. NTM and LSTM Generalisation for the Repeat Copy Task. NTM generalises almost perfectly to longer sequences than seen during training. When the number of repeats is increased it is able to continue duplicating the input sequence fairly accurately; but it is unable to predict when the sequence will end, emitting the end marker after the end of every repetition beyond the eleventh. 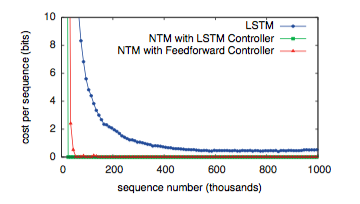 LSTM struggles with both increased length and number, rapidly diverging from the input sequence in both cases. Many have offered thoughtful insights, but we would especially like to thank Daan Wier- stra, Peter Dayan, Ilya Sutskever, Charles Blundell, Joel Veness, Koray Kavukcuoglu, Dharshan Kumaran, Georg Ostrovski, Chris Summerfield, Jeff Dean, Geoffrey Hinton, and Demis Hassabis. learning to align and translate. abs/1409.0473. Barrouillet, P., Bernardin, S., and Camos, V. (2004). Time constraints and resource shar- ing in adults’ working memory spans. Journal of Experimental Psychology: General, 133(1):83. Chomsky, N. (1956). Three models for the description of language. Information Theory, IEEE Transactions on, 2(3):113–124. Das, S., Giles, C. L., and Sun, G.-Z. (1992). 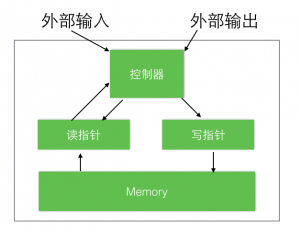 Learning context-free grammars: Capabil- ities and limitations of a recurrent neural network with an external stack memory. In Proceedings of The Fourteenth Annual Conference of Cognitive Science Society. Indiana University. Dayan, P. (2008). Simple substrates for complex cognition. Frontiers in neuroscience, 2(2):255. Eliasmith, C. (2013). How to build a brain: A neural architecture for biological cognition. Oxford University Press. Fitch, W., Hauser, M. D., and Chomsky, N. (2005). The evolution of the language faculty: clarifications and implications. Cognition, 97(2):179–210. Fodor, J. A. and Pylyshyn, Z. W. (1988). Connectionism and cognitive architecture: A critical analysis. Cognition, 28(1):3–71. Frasconi, P., Gori, M., and Sperduti, A. (1998). A general framework for adaptive process- ing of data structures. Neural Networks, IEEE Transactions on, 9(5):768–786. Gallistel, C. R. and King, A. P. (2009). Memory and the computational brain: Why cogni- tive science will transform neuroscience, volume 3. John Wiley & Sons. Graves, A. and Jaitly, N. (2014). Towards end-to-end speech recognition with recurrent neural networks. In Proceedings of the 31st International Conference on Machine Learn- ing (ICML-14), pages 1764–1772. Graves, A., Mohamed, A., and Hinton, G. (2013). Speech recognition with deep recurrent neural networks. In Acoustics, Speech and Signal Processing (ICASSP), 2013 IEEE International Conference on, pages 6645–6649. IEEE. Hadley, R. F. (2009). The problem of rapid variable creation. Neural computation, 21(2):510–532. Hazy, T. E., Frank, M. J., and O’Reilly, R. C. (2006). Banishing the homunculus: making working memory work. Neuroscience, 139(1):105–118. Hinton, G. E. (1986). Learning distributed representations of concepts. In Proceedings of the eighth annual conference of the cognitive science society, volume 1, page 12. Amherst, MA. Hochreiter, S., Bengio, Y., Frasconi, P., and Schmidhuber, J. (2001a). Gradient flow in recurrent nets: the difficulty of learning long-term dependencies. Hochreiter, S. and Schmidhuber, J. (1997). Long short-term memory. Neural computation, 9(8):1735–1780. Hochreiter, S., Younger, A. S., and Conwell, P. R. (2001b). Learning to learn using gradient descent. In Artificial Neural Networks?ICANN 2001, pages 87–94. Springer. Hopfield, J. J. (1982). Neural networks and physical systems with emergent collective computational abilities. Proceedings of the national academy of sciences, 79(8):2554– 2558. Jackendoff, R. and Pinker, S. (2005). The nature of the language faculty and its implications for evolution of language (reply to fitch, hauser, and chomsky). Cognition, 97(2):211– 225. Kanerva, P. (2009). Hyperdimensional computing: An introduction to computing in dis- tributed representation with high-dimensional random vectors. Cognitive Computation, 1(2):139–159. Marcus, G. F. (2003). The algebraic mind: Integrating connectionism and cognitive sci- ence. MIT press. Miller, G. A. (1956). The magical number seven, plus or minus two: some limits on our capacity for processing information. Psychological review, 63(2):81. Miller, G. A. (2003). The cognitive revolution: a historical perspective. Trends in cognitive sciences, 7(3):141–144. Minsky, M. L. (1967). Computation: finite and infinite machines. Prentice-Hall, Inc. Murphy, K. P. (2012). Machine learning: a probabilistic perspective. MIT press. Plate, T. A. (2003). Holographic Reduced Representation: Distributed representation for cognitive structures. CSLI. Pollack, J. B. (1990). Recursive distributed representations. Artificial Intelligence, 46(1):77–105. Rigotti, M., Barak, O., Warden, M. R., Wang, X.-J., Daw, N. D., Miller, E. K., and Fusi, S. (2013). The importance of mixed selectivity in complex cognitive tasks. Nature, 497(7451):585–590. Rumelhart, D. E., McClelland, J. L., Group, P. R., et al. (1986). Parallel distributed pro- cessing, volume 1. MIT press. Seung, H. S. (1998). Continuous attractors and oculomotor control. Neural Networks, 11(7):1253–1258. Siegelmann, H. T. and Sontag, E. D. (1995). On the computational power of neural nets. Journal of computer and system sciences, 50(1):132–150. Smolensky, P. (1990). Tensor product variable binding and the representation of symbolic structures in connectionist systems. Artificial intelligence, 46(1):159–216. Socher, R., Huval, B., Manning, C. D., and Ng, A. Y. (2012). Semantic compositionality through recursive matrix-vector spaces. In Proceedings of the 2012 Joint Conference on Empirical Methods in Natural Language Processing and Computational Natural Lan- guage Learning, pages 1201–1211. Association for Computational Linguistics. Sutskever, I., Martens, J., and Hinton, G. E. (2011). Generating text with recurrent neural networks. In Proceedings of the 28th International Conference on Machine Learning (ICML-11), pages 1017–1024. Sutskever, I., Vinyals, O., and Le, Q. V. (2014). Sequence to sequence learning with neural networks. arXiv preprint arXiv:1409.3215. Touretzky, D. S. (1990). Boltzcons: Dynamic symbol structures in a connectionist network. Artificial Intelligence, 46(1):5–46. Von Neumann, J. (1945). First draft of a report on the edvac. receptors to working memory. The Journal of Neuroscience, 19(21):9587–9603.